There is NEVER a dull moment! Searching the net to confirm it was indeed the dreaded blight I discovered various organic treatments; the base ingredient of which was baking soda. What the hell is Portuguese for Baking Soda, I asked myself? Okay, apparently it’s Bicarbonato de Sódio. So tomorrow I’ll be on a mission to buy some! Yes, you can buy it. It’s located in the ‘baking’ aisle of major supermarkets such as Intermarche and Continent. Further research also revealed that regularly spraying the plants with the following concoction also helps prevent mildew on squash, courgettes, aubergines and cucumbers etc. Fingers crossed. So why Bicarbonate of Soda? Apparently, when you spray the leaves with the baking soda solution it lowers the PH on the leaves which in turn helps to prevent the leaf blight spores from growing. Application: Apply using a sprayer. When to spray: Early morning or late evening. How often: Daily – weekly. I think this depends on the location and level of humidity. I’ll spray daily and see how it goes. I found this video and website helpful. This evening I sprayed the plants just before sunset so the solution does not burn the leaves in the heat of the sun. Hopefully … we will see what tomorrow brings and if further leaves become infected over the next week. Have you tried using this method? If not, watch this space. Raised Vegetable Bed – Third Time Lucky! Use the British measurement not the US one, good luck. Good luck, PiP! 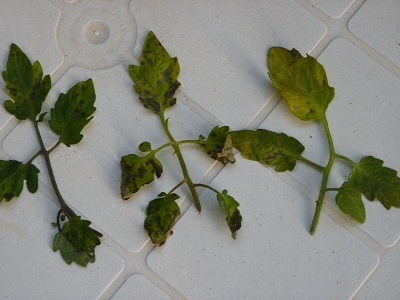 That solution just might eradicate blight. This is going to be interesting; let’s hope it works. Simple! Use metric!! And I have had success with bicarb . . . meanwhile water just to ‘elegant sufficiency’ along the soil area and let the leaves absorb the ‘medicine’ 🙂 ! love and success . . .